In this article we will see an example of SAX parsing. SAX (Simple API for XML) is an event-driven, serial-access mechanism that does element-by-element processing. Since it loads the elements in chunk, it doesn’t use much of the memory which is why it is a preferred parser for large size XML. Java provides a full support to implement SAX, we don’t need to add any external jar but Java API for XML Processing (JAXP) allows you to plug in any implementation of the SAX API and override the default one. SAX API reads the XML as I/O stream and the framework delivers SAX events as it reads the data. Once a batch of data is read the position, the parser cannot go back to an earlier position or leap ahead to a different position. Whenever SAX API comes across an event,it calls a callback method from the application. For example, the SAX parser calls one method in your application when an element tag is encountered and calls a different method when text is found. SAX is an event based parser where it reads data in batches, calls the callback methods from the application as and when it encounters certain events. For example, it calls startDocument() when the parser is at the beginning of the document. It calls startElement() when it encounters opening tag. It next calls characters() and sends in the character data inside the element. It then calls endElement() when it encounters the end of an element. This continues as and when it encounters starting and ending of elements. Finally, the parser calls endDocument(). Since SAX is a stream based parser it requires much less memory than DOM, because SAX does not construct an internal representation of the XML data, as a DOM does. We need a content handler which converts the XML into POJO objects. Extend DefaultHandler and implement the event handlers. The handler most probably will end up implementing callbacks startElement(), characters() and endElement(). Once the parser and content handler is created, all we have to do parse the XML. Here is the XML we want to parse. Here is the POJO representation of the XML. In the below custom handler, we implement startDocument(), startElement(), endElement(), characters() and endDocument(). 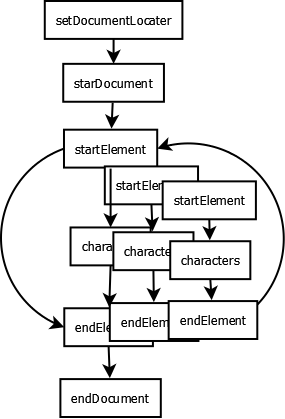 startElement() – We create Employee bean and push it to stack. We also parse the id attribute and set employee’s id. endElement() – In here, we parse the name and age elements. empStack.peek() returns us the current employee bean. Once employee end element is encountered, we push the constructed employee bean to the parsed employee list. characters – We construct the element’s value. endDocument – Once the end of document is encountered, we print the employee beans. This was an example about SAX Parser.